The opening reception for Church of Totem took place at the Linfield Gallery and in the courtyard immediately outside the Miller Fine Arts complex on the Linfield College campus in McMinnville, Oregon. 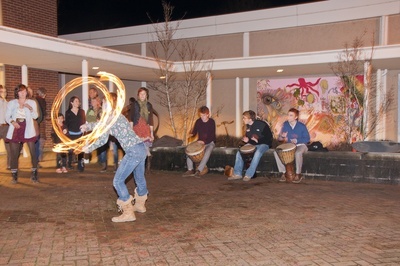 The event included performance art, music, conversation, drumming, and fire dancing. Attendees were invited to insert their own experiences into the exhibit, both mentally and physically, by bringing copies of family photos that were pinned to the gallery wall, forming a collaborative installation. For a video excerpt of the fire twirling performance, refer to Fire Twirling at the Church of Totem Opening Reception. Kerrigan, John F., "Church of Totem Opening Reception 30" (2012). Church of Totem. Image. Submission 30.